Despite my quick defeat there is still a lot to learn. I made some very interesting and common mistakes. 1. d4 Nf6 2. c4 g6 3. Nc3 d5 4. Nf3 Bg7 5. Qb3 dxc4 6. Qxc4 O-O 7. e4: So we’re halfway through the game already, and I have played these seven flawless moves countless times. Like many a GM before me I plan to evacuate my queen when piece or pawn pressure forces it to retreat. I will get a nice center and c5 will take two moves. It’s not the technical refutation of the Grunfeld, but then again if there is one it’s a well-kept secret. Things don’t stay this rosy for long. 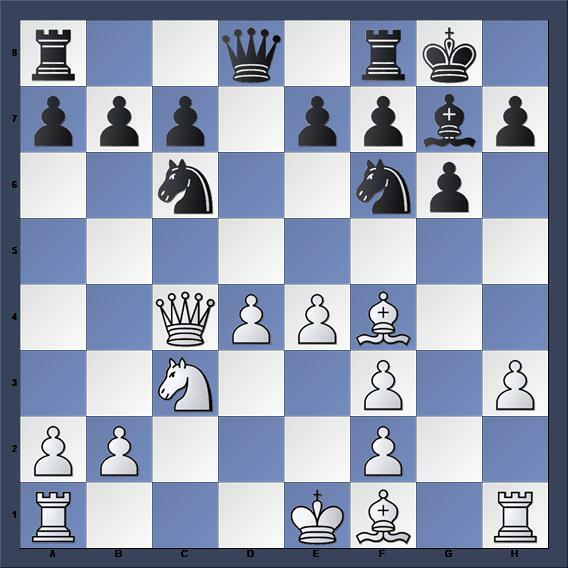 7…Bg4: This harmless seeking move takes me out of well-rehearsed lines. I feel like I’ve had trouble with it before, and even looked up the rejoinder to it. Of course it didn’t stick because I would have needed to understand the point behind it. It indirectly weakens d5, and will probably be paired with Nc6 afterwards. That much I get. However it is Nc6, or c6, or Nbd7, or even the eccentric Na6. Black could have played any of those moves but chose not to do so. Rule number one: Think about what the past move didn’t do! Black didn’t attack b4 like he would have if he played Na6. Nbd7 would have eliminated the queen’s pressure on d5. So black thought his plan, whatever it is, was more important than fianchettoing his queen bishop with b6 and controlling the light squares. A devious and cunning opponent is going to throw a feint your way once in a while and try to conceal his intentions. To survive you must often ferret out the deception. You must understand what each move does and does not do. It may not be the best try, but you still have got to try to refute it. 8. Bf4: This move is correct. I assay black’s 7th move and determine that the bishop can develop with a tempo due to the weakness of the c pawn. I’m really hoping that c6 comes. I don’t know how to handle Nc6. Rule Number Two: Assuming your opponent will comply with the move you want or expect can cost you a lot. I highly recommend Andrew Soltis’ The Inner Game of Chess which talks about unanticipated moves at length. Having the vanity to assume that your variation is the only variation is to be okay with constant surprises. That’s not planning! Lasker played inferior moves just to create puzzles. What if your opponent doesn’t know what the best move is? I soon have no idea what to do when my opponent counters my threat with a developing move and a threat of his own. 8…Nc6: Doesn’t black want to push his c pawn? This can’t be right, or can it? I can’t advance my center just yet because d5 is weakening. The g7 bishop will then become a monster. If I castle I have to live with a terrible pawn structure for the next thirty moves. I’m white, how come I have to make all of the hard choices? Whatever happened to the advantage of first move? I don’t know what to do. 9. h3 can’t be terrible and isn’t that the only thing left over? I won’t lose material after Bxf3 because of the pin on the knight (that’s not even close to true). White is guided by faulty assumptions based on a lack of understanding. I soon pay the price. 9. h3? : Believe it or not this move, the first ‘mistake’ of the game, is losing. 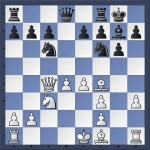 9…Bxf3 10. gxf3 Nh5: Please see rule number two! I also miscalculated and thought that I would win have counterplay no matter which piece took my pawn. One mistake closely follows another. I won’t give you a picture as it will only further the embarrassment. Needless to say black’s knight and extra pawn are more than enough to claim a winning advantage.